When the Ares III manned mission to Mars is hit by an intense storm, astronaut Mark Watney is lost and presumed dead. With the lives of her crew at stake, mission commander Melissa Lewis is forced to leave the planet, leaving Watney behind. Watney has survived with the destruction of his communications equipment. Unable to contact NASA, he uses his knowledge as a botanist to grow food within the mission's artificial habitat, anticipating that he will need to survive for at least three years and journey to the landing site of Ares IV which already has some of its infrastructure on Mars. He keeps a series of video logs to maintain morale and begins to modify the habitat's rover to make it capable of long journeys. Reviewing satellite photos of Mars, NASA engineers Vincent Kapoor and Mindy Park realize that Watney has survived, and immediately start planning to establish contact. Fearing that Watney may die soon, NASA director Teddy Sanders orders them not to tell the rest of the Ares III crew aboard the Hermes. Watney locates the Pathfinder probe, defunct since 1997, and uses it to regain contact with Earth. As Watney continues to grow his crops, crew supervisor Mitch Henderson and JPL director Bruce Ng formulate a plan to send a probe to Mars and resupply Watney to let him last the four years until Ares IV can reach him. As the launch date approaches, an increasingly optimistic Sanders authorizes them to tell the crew. Desperate to launch the probe quickly, mistakes are made and the probe explodes during the launch. Watney suffers his own disaster when the airlock on the habitat explosively decompresses, killing his crops and reducing his projected supply of food. Applaud the 'Iron Man' botanist astronaut who not only survived on Mars but managed to plant some crops! 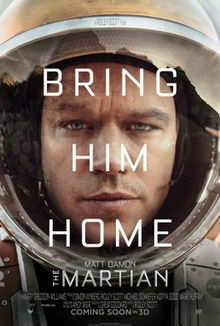 I know, it's just a movie but I believe this will come true especially since they found streams in Mars recently. Anyway, the movie was good with some laughter and mostly serious survival skills. It started with a bang and then in a melancholy state until the pace picked up again towards the end. Truly awesome and it made me wished I had picked up astronaut way back then!